Speak softly and carry a great guide. My first residence in Vienna, not including my dorm room in the 3rd district, was a small apartment on the first floor of a four-story building in the second district. The apartment boasted high ceilings, a shower in the kitchen, and a shared toilet in the hallway (shared with the next door neighbor who liked to chain smoke while using it). I am not sure whether Remaxx would have listed the place as a 2 or 3-room apartment since the kitchen was nothing more than a galley connecting the bedroom and the living room. The apartment had no central heating – just two wood and coal burning stoves that forced me to lug more coal bricks and scrub more soot off of more tall double windows than I care to recall. The bedroom was long and narrow and the best thing about it was the towering oak tree outside the double window. The tree was multi-functional. First, it served as a home for a woodpecker that liked to peck peck peck at ungodly hours of the morning. Second, and more importantly (in my humble opinion, not Woody’s), its blanketing green leaves served as a screen to the neighbors across the courtyard who liked to hang out on their little balcony in their off-white granny pants while huffing and puffing on their cigarettes. (Austria had a lot of smokers back then). Third, the tree provided shade and kept the bedroom cool all summer. But best of all, the tree absorbed most of the noise that ricocheted throughout the courtyard during the summer months when everyone had their windows open and children liked to play. But just one floor up lived a Chinese couple who were dear friends and neighbors and Wei did not agree that the tree provided ample sound-buffering. He dreaded the noise from the sandbox play, soccer ball bounces and name calling in not-so-indoor voices. He was a student at the University of Vienna who greatly valued his afternoon naps. Sometimes when very annoyed, he would open his window and yell down and tell them to stop being so loud. But otherwise, I have to say that Viennese kids, and Europeans tend to speak softly. And we Americans? It’s not like we’ve never been taught the virtues of being quiet. You remember, don’t you? The bell rang and the teachers stood holding the doors, ushering the students in from recess or break. Never failed. Amongst the centennials, there was always that one teacher who thought it her God-given duty to lean into the passing students and remind each and everyone of them that it was “Time to use your indoor voices.” How syrupy over-cheerful and very annoying her own sing-song voice chimed out those reminders. And yes, it was always a female teacher doing the dirty work, never the guys. The Indoor Voice. We all learned about the indoor voice but then– Maybe we were too busy using our outdoor voices to hear the teacher demanding the indoor voices? 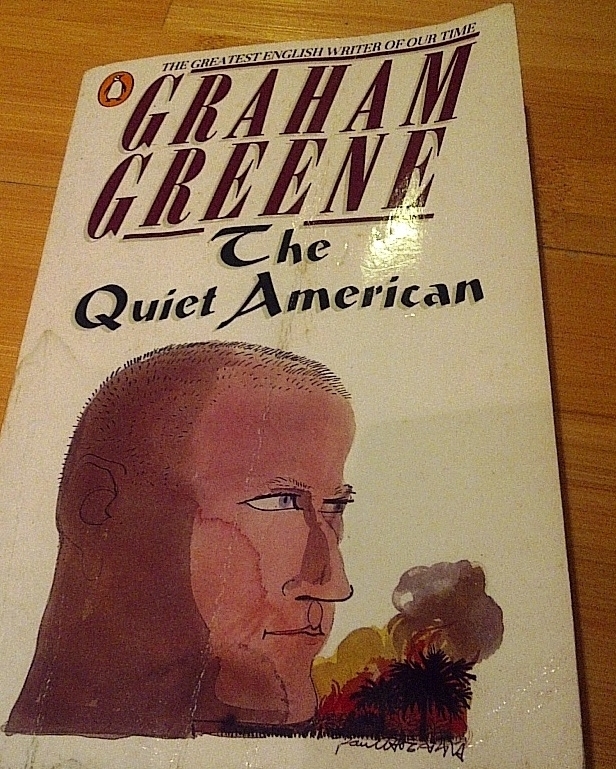 British writer, Graham Greene, wrote a book entitled “The Quiet American.” The American abroad was quiet, and therefore rather suspicious. Unfortunately, I must concede with the Europeans, we Americans do tend to rarely use our indoor voices –regardless if we are in- or outdoors. And invariably, when I am on the subway and a group of people are being rather loud, the group is almost always a bunch of my fellow countrymen – students or tourists. Or maybe a bunch of Canadians well disguised. The others – like Swedes when they are drunk and visiting Vienna for a soccer match or Russians when they are just drunk, can also be loud but we Americans beat all other nations hands down with our ability to ignore the general tone level of our environment. Even when my fellow Americans are sitting across from one another having a “normal conversation,” unter sich they tend to be loud enough for the rest of the subway car to listen in. Why can’t we just tone it down a bit? I once spent a whole train ride from Wien Mitte to the airport (about 30 minutes) listening to an American woman and man discuss why a person in their department had to be fired. If you are interested in knowing too, drop me a line, I know every gory detail. The next edition should be less syrupy overly cheerful and sing-song and simply tell it like it is — that a loud voice is always perceived as an obnoxious voice so keep it down. No innocent bystanders are interested in the turbulance of your plane ride or your encounters with the locals who have the audacity not to speak proper English. Please do me, yourself, your fellow Americans and your host country a great big juicy favor –when traveling abroad, do as the natives do and speak softly, tread gently, and carry a good guide (like my website on your iPad).